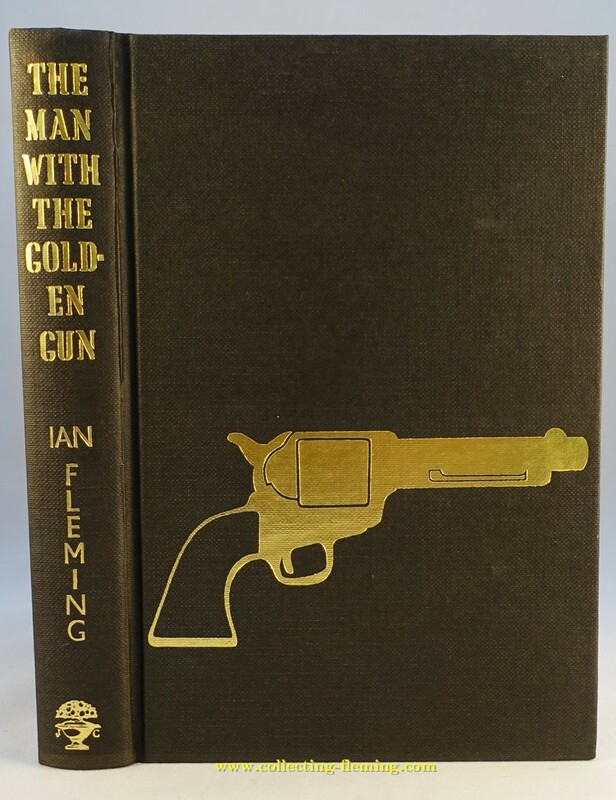 A first edition of The Man With The Golden Gun (TMWTGG) in average condition is worth perhaps £100 ($155) unless its one of the first few copies that has an embossed gun on the front board. Such copies are worth around 100 times more (£10000 / $15500). The high price of these editions unfortunately means there are a few fake copies on the market. 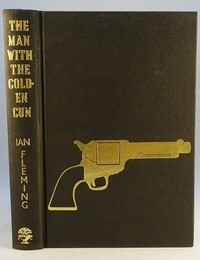 All previous Fleming books published by Cape had decorated front boards (see the gallery) and the plan was for TMWTGG to have the gun design as shown. After around 1% of the first edition print run was produced it was realised the cost of adding the large area of gilt to the front was too expensive. The solution chosen was to remove the gun and have plain boards. The 1% with the gun represent the first copies printed so are very much in demand by collectors who want a complete set of first edition / first state books. As the book was released worldwide the first printed copies were shipped by sea to the far corners of the British Commonwealth, for this reason copies tend to be found in Australia, New Zealand and South Africa. 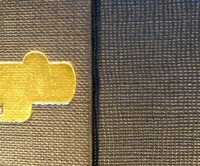 As export copies the dust jackets are normally found price clipped. 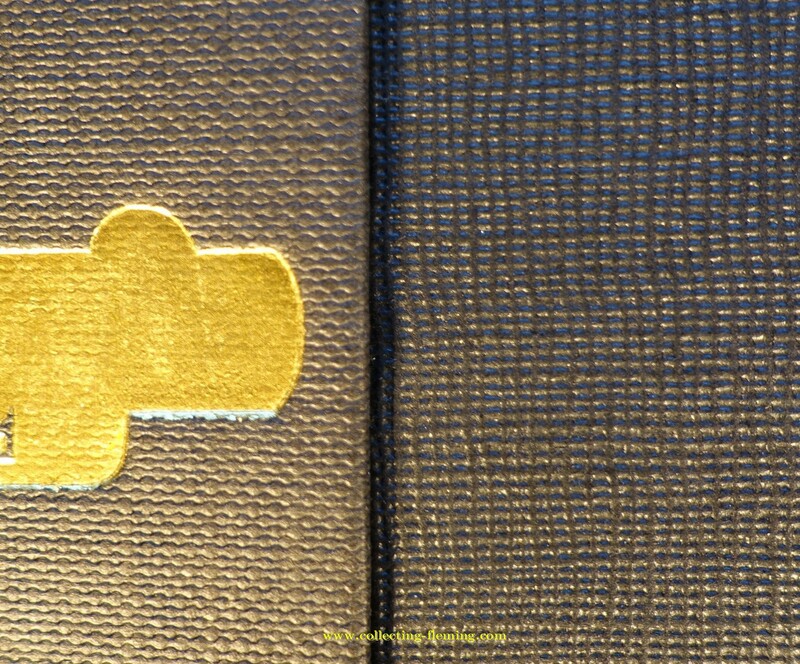 If a copy is for sale with an unclipped dust jacket then its likely that the original jacket has been swapped for one that is in better condition - uniquely this is one Fleming book where the condition of the dust jacket has little effect on the value of the book. Rising values and awareness of this rare edition has lead to more copies being discovered and coming on to the market. This has not subdued prices as it is now seen as an essential part of a collection of first editions rather than an interesting curiosity / variant. 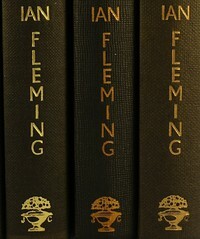 The well known collector James Pickard wrote an article on Investing In Ian Fleming in 2008. In this he values the books at £4500 ($7000). At the time of writing (March 2015) there are 9 copies for sale on abebooks ranging from £6000 to £12000 with an average asking price of £9500 ($15000). The value of these books has unfortunately resulted in a few fake copies coming on to the market. 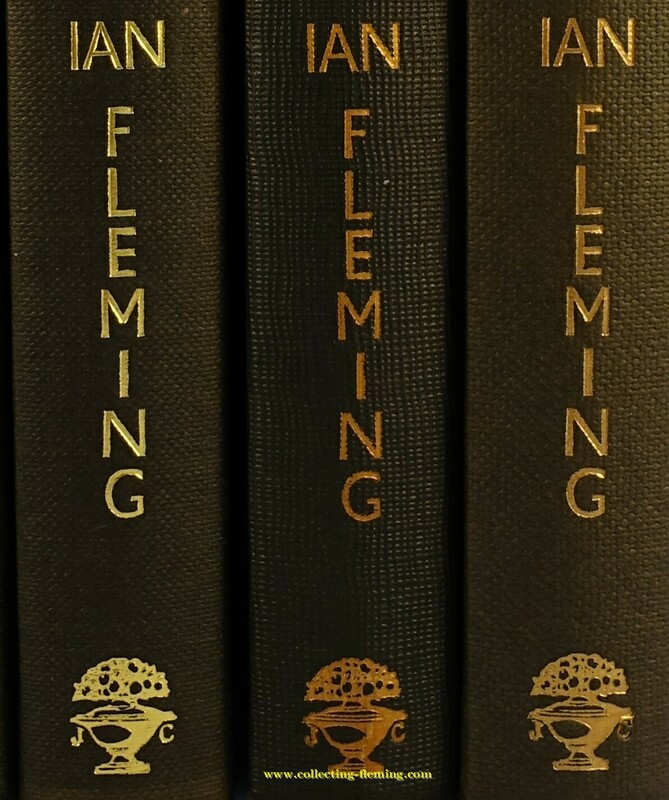 If buying from a dealer I would recommend buying from one who specialises in Fleming books as non-specialists may not have handled a copy of this rare book before meaning they may not spot a fake. The first thing to check before buying a copy is the gun itself - the image shown compares a fake (top) that was recently offered for sale with that of a genuine copy (bottom). If the gun does look genuine check carefully for the condition of the gilt such as missing areas or oxidization - the gun is what makes the book valuable so its condition is important. Fortunately when the gun was removed from the front board the cloth was also changed. 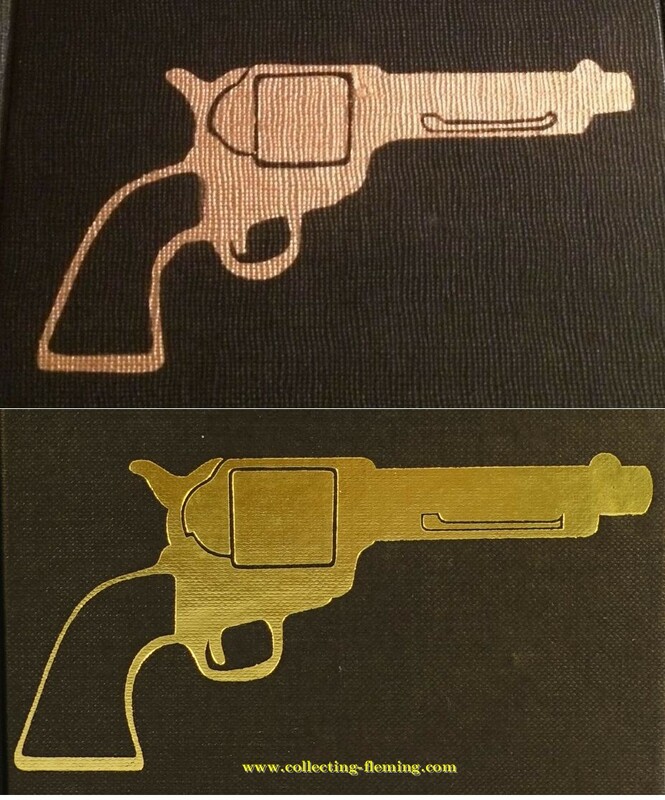 The vast majority of the 1st editions (which did not have the gun) had the cloth as shown on the right, perhaps the change of cloth was another cost saving measure? There is one other printing worth mentioning here, the First Edition Library (FEL) replica copy. 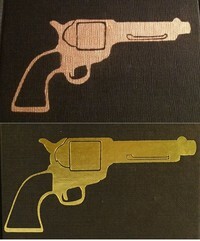 This does have the embossed gun to the cover. It is unlikely to be mistaken for the real thing, the cloth is different, the paper is different (stays bright white) and it has a clear indication on the copyright page saying its a FEL edition. They are however collectable in their own right and do a good job of filling gaps in collections of the Cape originals. There are no comments at this time - be the first to share your thoughts! If you have any information or advice that you wish to add to this article please post a comment below. Comments have to be approved by a moderator before they are displayed. Your email address is required but will not be published.